This single vineyard wine from Chile's Casablanca Valley D.O. is sourced from the Santa Isabel Estate which is located a mere 12 miles away from the pacific ocean. The wine was made by head winemaker Ximena Pacheco who has gained extensive experience working with world class winemakers (Paul Hobbs, Aurelio Montes, ect) on various projects around the globe. 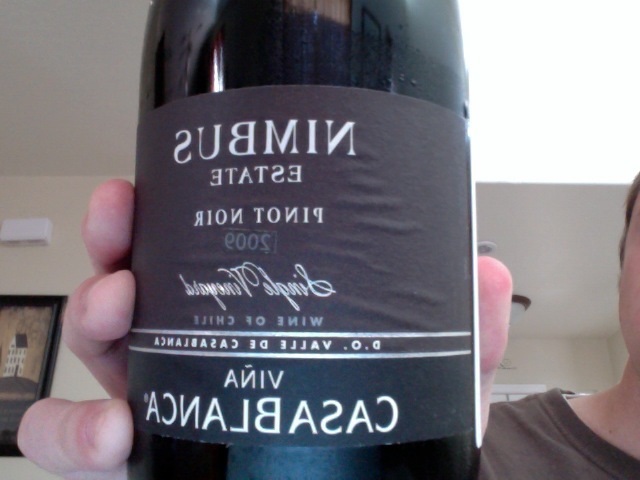 The wine is 100% Pinot Noir and was aged for 10-12 months in French oak barrels. 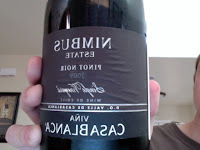 The 2009 Nimbus Estate Pinot Noir is dark ruby in color and displays aromas of brambly raspberry jam, vanilla, oak, anise, and hints of sage. On the palate this wine is boldly extracted and has a rich and powerful body. Ripe black fruits take central stage displaying flavors reminiscent of blackberry, black currant, graphite, licorice, spice, and cedar. The finish is very long and literally tattoo's the palate with a huge dose of black currant, licorice, and some big dry tannins.